Does Your Underweight Child Need Physical Activity? Underweight issues in children can arise due to several reasons. If both the parents are lean or have a family history of being underweight/thin, then the child may be underweight too. In some cases, the child himself would not put on weight due to unhealthy eat habits or not eating at all. In all the above cases, parents should understand that your child needs to be physically active to stay fit and healthy. Physical activity makes them stronger with respect to muscle mass and bone weight. 1. Meet a pediatrician for help and he/she may suggest some safe supplements. 2. Meet a dietitian and bring a change in your child's diet. Make his/her food interesting, creative and tasty. Fats and proteins play a major role in your child's weight gain. 3. Get involved in your child's physical activity to motivate them. Take them out for cycling. Try and get them back home by a cycle. Teach them to walk fast. 4. Play an outdoor game like football or volley ball or enroll them to a sports club. Teach yoga and swimming. 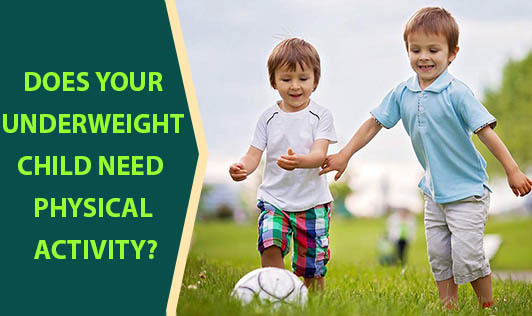 Irrespective of your child's weight, physical activity is important. It is also important to decide the amount of physical activity needed. Talk to a doctor for the same and, as said earlier, bring about a change in your child's diet.